America’s seemingly insatiable desire for opioids is driving up overdoses to a level beyond what has ever been seen before. Drug overdoses are now the leading cause of death for Americans under 50. Based on preliminary data, approximately 64,000 Americans lost their lives to drug overdoses last year, according to the Department of Justice. This is up 23 percent from 2015, when 52,000 people died of overdoses. The majority of these deaths can be attributed to opioids, including illicit fentanyl and its analogues, said Attorney General Jeff Sessions. “That would be the highest drug death toll and the fastest increase in that death toll in American history,” Sessions said during a speech to law enforcement officers in Harrisburg, Pennsylvania, on Sept. 22. Pennsylvania has been hit hard by the crisis, with an average of 13 people dying of an overdose per day last year. The state’s fatal overdoses jumped 37 percent from 2015 to 2016. “These trends are shocking, and the numbers tell us a lot—but they aren’t just numbers. They represent moms and dads, brothers and sisters, neighbors and friends,” Sessions said. Most often an opioid addiction starts with a prescription pill obtained through a friend or family member. It can take just one painkiller like oxycodone, or an anti-anxiety medication like Adderall, for some people to get hooked. 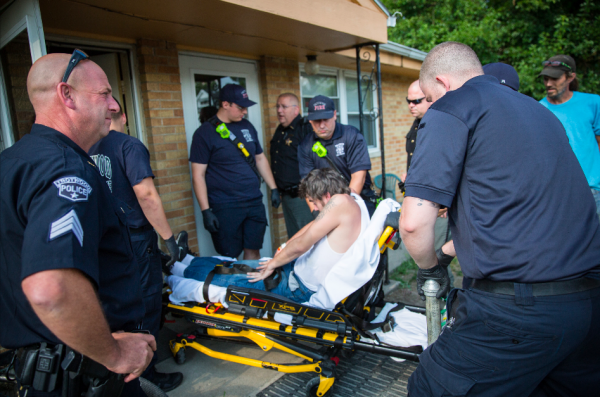 A typical scenario is that, once hooked, the addict will exhaust all options to obtain more prescription pills, and once that becomes too difficult or too expensive, heroin becomes the drug of choice. Now, however, heroin is laced with synthetic derivatives such as fentanyl, which is mostly made in China. Fentanyl, originally developed as a painkiller and an anesthetic, is 50 to 100 times more potent than heroin. Two milligrams of fentanyl is a lethal dose for a non-opioid user. “A police officer in Eastern Ohio suffered an overdose after brushing what he thought was white powder from his uniform after a routine traffic stop,” Sessions said. The powder was fentanyl. The synthetic carfentanil is less common but much more deadly; it is used as an elephant tranquilizer and is 10,000 times more powerful than morphine, according to the DEA. Even a few specks of airborne powder can be fatal. So, overdoses are increasing, the death toll is rising, and emergency services are using more and more Narcan to revive patients. Narcan is an opioid-blocker than can often revive an overdose patient within minutes. 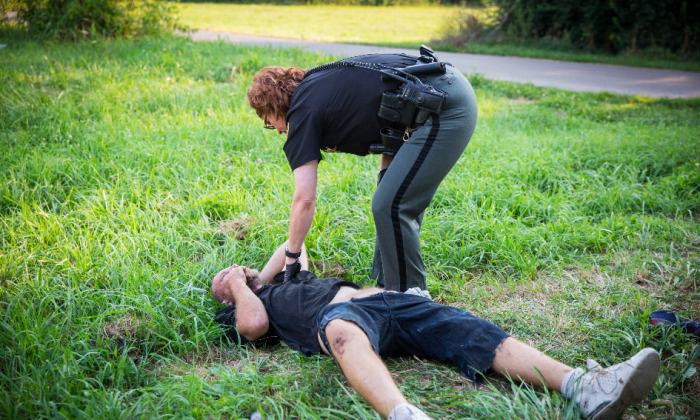 Between 2013 and 2014, there was a 79 percent increase in deaths related to synthetic opioids, according to the 2016 Drug Enforcement Administration (DEA) heroin report. Sessions said prescription opioid addiction costs the economy an estimated $78 billion a year, while illicit drugs cost about $193 billion a year. President Donald Trump has said stemming the drug crisis is a priority for his administration. He said federal prosecutions will increase again, after decreasing by 23 percent between 2011 and the end of 2016. Secretary of Health and Human Services Tom Price said, during a press briefing on Aug. 8, that a vaccine for addiction is being developed and that the agency is looking into alternatives to narcotics for pain treatment. On the law enforcement side, Sessions announced that $58.8 million has been allocated to strengthen drug court programs and to help public health agencies address prescription drug and opioid abuse. “Combatting this poison is a top priority for President Trump and his administration, and you can be sure that we are taking action to address it,” Sessions said on Sept. 22. Another $22.2 million will go toward treatment for veterans and $9.5 million toward juvenile programs. Two months ago, Sessions said the Department of Justice arrested more than 400 people in the largest health care fraud takedown in American history. “More than 100 of these defendants have been charged with opioid-related crimes, including many doctors. This was also the largest opioid-related fraud takedown in American history,” Sessions said. A week later, the department seized AlphaBay, the largest darknet marketplace for selling drugs. “This site hosted some 220,000 drug listings and was responsible for countless synthetic opioid overdoses, including the tragic death of a 13-year-old in Utah,” Sessions said. In August, Sessions announced the formation of a unit that will investigate the overprescribing of opioids within the health care system.